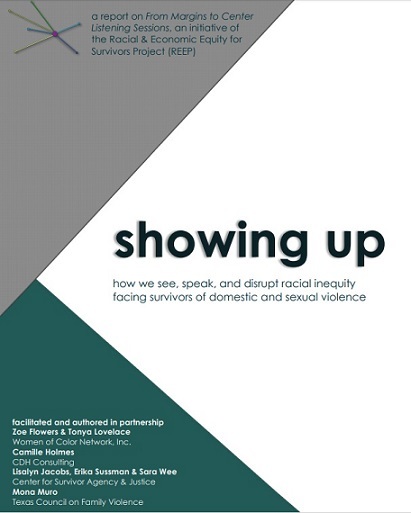 In September 2017, REEP facilitated seven From Margins to Center Listening Sessions to facilitate dialogue across the field on racial and economic equity for survivors. This report dialogues-back with the community that contributed to the From Margins to Center Listening Sessions. It shares themes and issues from Listening Session conversations via text, graphics and illustrations in order to aid in self-reflection, challenge dominant narratives, support improved data collection and analysis, and to begin, continue, or advance conversations and work toward racial equity for domestic and sexual violence survivors and for all of us.